Um well last day and a real opponent, Xpress. They are normally a good crew but this year they were weakened by loss of their stroke, who didn't technically fit within bumps rules, and for whom they'd failed to apply for a dispensation. So far they were down 2, yesterday to Champs 1. I'd've preferred a shot at Champs, but James H was keen for Xpress due to some history from the Olde Dayes. The pre-race talk was (again) about how they would be a proper challenge this time, and we'd get them on the reach if anywhere. And once again I believed it. Once again we were earlyish to Stourbridge, sat around chatting, nodded to St Neots who would be behind us and had pulled up next to us (wearing "Entries close Saturday 6pm" on their tops, since their regatta is next weekend), admired the fine weather and waited. W1 passed us with willow - well done them - which (coupled with W2 and M2 rowing over) meant we were well-placed for the JJ and would almost certainly win it if we bumped up. The row-up was as usual, with a rolling start under the Railway bridge and a standing start at the Plough. All well. Up, spin, wait. The GPS trace shows that our start was OK without being outstanding; but we got our first whistle after 10-15 strokes (from memory. Having now re-watched Press's rigger-cam it sounds to me like we got it on their tenth stroke). That was encouraging but (just like yesterday) I didn't take it too seriously. But then the rest of the race did turn into an eerie repeat of yesterday, and we got them pretty well where we got St Neots, in the gut. We close down to 2 whistles on FP reach, then 3, then continuous / overlap as we come around the corner and you see the tents on the meadow in the video. Then just as we pass "beached boat" the video abruptly cuts off - whether this is due to the tape running out, or is discretely drawing a veil over someone's crab, I don't know. But there's nothing in the video very obviously wrong with them; we were just faster. They have so-last-century wooden handle blades; we wouldn't be seen dead with such any more. By my count they take 15 secs for the first 10 stokes (that's 40), and the next 10, and the next; 16 for the next 10 (that's 38) and the next. So they weren't under rating us. Elation; again. Its a wonderful feeling. We pulled over to those two boathouses with landings and, very cutely, some young children there enthusiastically tore willow off their trees for us; once they'd started it was hard to stop them. This time we got to stop at the beer tree on the way back. And then the traditional row-home with cox in stroke's seat, and me in the cox's seat. We managed "cutting the cake" all the way up to the catch. And so home. Andy S supplied tinned Gin-n-tonic, then after that it all starts to blur. 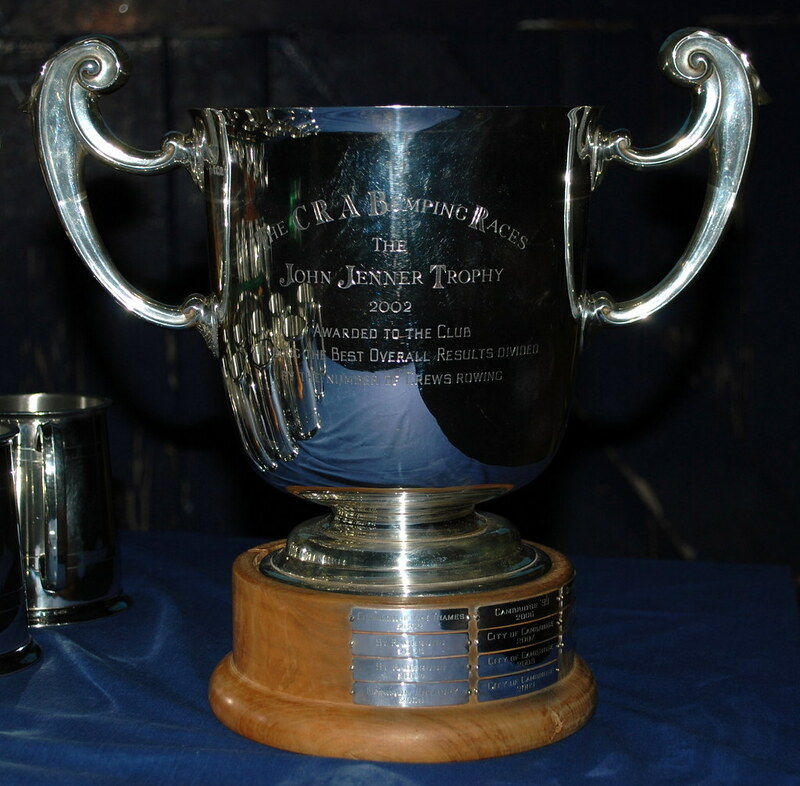 It certainly involved celebrations in the Waterman for the whole club as the John Jenner trophy was brought in triumphantly; there was drinking on the hard outside City and a modicum of naked rowing. For me it ended up with a walk home at 4:30 as the sky was lightening towards dawn. The final night and we were already up two places. We had Nines 2 behind who we'd Bumped easily the night before and were chasing Champs 1, who were on for spoons and had been bumped by their second crew earlier in the week. So we felt quite relaxed. We got a good start and the boat was running well. There was no danger from behind and we started to gain ground. After a big cheer from our supporters in the Gut we were less than a length off them, a good corner round grassy by Bow and 3 and we'd Bumped. We were all ecstatic. Up 3! Fantastic result! Row over: details to follow. Chasing Cantabs V once again. 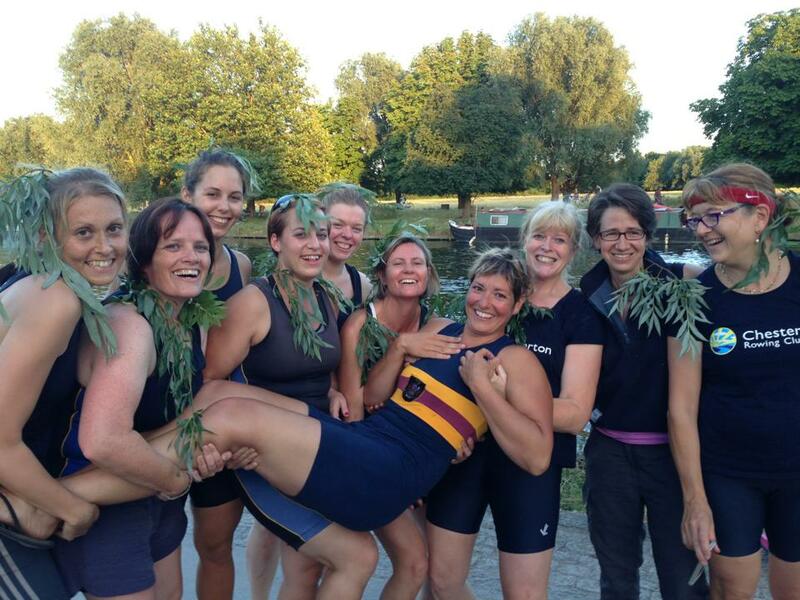 Ali the W1 cox was subbing for Kate out with a shoulder injury. Tonight's strategy was for a more controlled start and to gradually build to grind them down. They went off strong and were on their tail but both crews were fairly evenly matched and by the finish at Ditton the gap was just less than station. Another gutsy row over. And up two places on the week. Well, the beginning of one.